Looking for a challenging puzzle to engage the brain and challenge your logic reasoning skills? 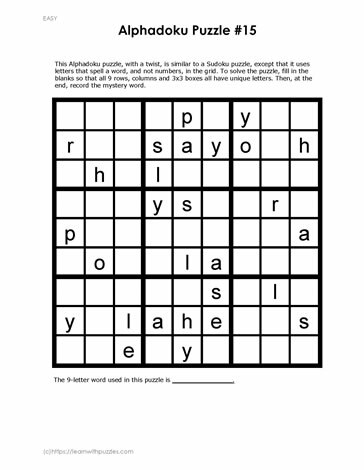 Download, print and some this Alphadoku puzzle that uses a unique nine-letter word to create the 9 x 9 grid. Remember to use basic Sudoku rules to solve the puzzle. When you have completed the puzzle record the unique nine letter word at the bottom of the page.